The Dept. 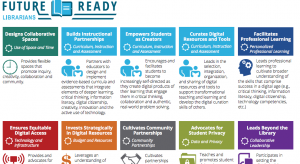 of Ed’s Office of Ed Tech has rolled out a initiative recognizing librarians as key players in the Future Ready movement. Now the challenge is up to us, librarians around the country, in schools large and small, urban and rural, to step up to the plate. The Future Ready platform defines areas where librarians can lead across the board. It’s a good framework to use as a starting place for our conversations (as are other sources on this Padlet.) So how can we lead? What are ways we can grow? By being student centered. Take time to reflect on your policies and space to be sure they are student centered, not library centered. Think about surveying your students or interviewing a few students to see how they view the policies or what suggestions they might have. Use students as an advisory team to help you. By asking what you can leave behind. My colleague David Jakes asks groups working on space design what they can leave behind. If we are going to move forward or add new things to our plate, we have to leave things behind. If we are going to change a policy, we have to leave a belief behind. If we redo our spaces, we are going to have to leave some things behind. What things can you leave behind? By believing you have value. You know the curriculum. You know the teachers. You know the tools. You know how to manage a space and you know how to budget and schedule. Share and believe in these strengths. Then consider–what new strengths can you develop? Be intentional about your growth. By embracing the new. New technologies, new teaching methods, new conferences, new tools. If you are technology nervous, challenge yourself to try a new tool every day for a month. Make a plan for how to gain more confidence. Remind administrators that just like students need a lot of tools to be literate (print and digital), so do librarians. We need to remember that a blended approach appeals to more students. As Levar Burton said recently when asked if students should be reading ebooks or print books? His response – “YES.” Yes to both. We don’t have to make this a binary choice (nor do administrators). It is about surrounding students with literacies of all kinds, tools of all kinds. By making sure your space is a reflection of the learning you want to happen in it. Ask students what they think of it, or how it could be improved, and then build on their ideas. Find resources and people to help–Don’t be shy about asking for what you need. By sharing the stories. Share what you do to help student learning — often the work we do isn’t as visible as that of teachers, so be sure to find a way to share the story whether through a newsletter, a video, a blog, a slide show, etc. Make your work more visible. Share the new things you’ve tried. We need to work on this faster. It’s really past time to stop deferring our own growth because every year we wait, students are passing through our hands who might have benefitted even more from our work. The Department of Education has opened a giant door for librarians in the Future Ready conversation–now we need to walk through that door (if we haven’t already) and get on board. There are so many library voices out there online but these blogs might provide a starting point. Also, check out resources on the Padlet (above). It’s easy to get overwhelmed with all the work we have to do. Take a day this summer to get inspired and make a strategic list of goals for the year. We just need to start somewhere! Let’s get some library change started!